The Athenas have been on a roll to start their season winning 10 out of their first 12 matches. “This showed that we are capable of beating good teams,” senior outside hitter Kelsie Sievers said. They went into Tuesday’s meeting with the Leopards hoping to bounce back from a loss to Washington University of Missouri and extend their road record to 3-0. The first game got off to a fast-paced start. La Verne delivered a powerful block by Sievers and junior middle blocker Briana Voght to take an early 3-1 lead. The Athenas then made a comeback to take the lead, 7-4. La Verne hustled to keep the ball alive and got to their spots but CMS continued to widen the lead, 12-8. Though the Athenas were up, the Leopards did get kills from Sievers, Voght, and senior middle blocker Katelyn Winiecki to keep themselves in the game and bring the lead to single digits. A kill from Sievers brought the deficit to five points, 24-19, but the Athenas held on to take a 25-19 lead with a kill by freshman outside hitter Jackie Jones. The Athenas came out in the second set up 10-5. La Verne started slow, not hustling to the ball and committing errors. Winiecki and sophomore outside hitter Emma Estigoy made a block that brought the Leopards back to within two points 10-8. After an attack error by Claremont junior setter Phoebe Madsen, the game was tied. La Verne then capitalized and went on a 4-0 run. The run started with a kill from sophomore setter Madison Maynes and ended with a service ace from freshman outside hitter Hayley Celaya. La Verne was communicating better and started making hustle plays, it gave the team energy and helped them get in the game. “We played with each other as a family and with heart,” Winiecki said. In set three, the score was close as both teams were going back and forth. The Athenas jumped to a 6-4 lead as the Leopards started off slow. Sophomore middle blocker Melanie Moore gave the Athenas a 10-6 lead on a kill. The Athenas were also building a lead off the Leopards’ errors. The Leopards went on a 5-0 run to bring the deficit to two 15-13. Plays by Sievers, freshman liberos Sabrina Sullivan and Julia Trujillo got La Verne within one at19-18. The Athenas eventually took set three 24-21. 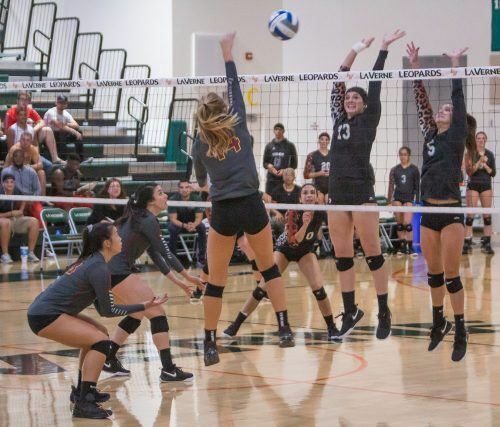 It was the same story in the fourth set, La Verne was able to build a 10-point lead 14-4. But once again, the Athenas were able to get back in the game due to errors. La Verne was able to get themselves together and take the set with a Sievers’ kill. The Leopards won set four 25-15. In set five, the Leopards just could not catch a break. Though the Athenas made three straight errors, that allowed the game to be tied at 8-8, things did not go the Leopards’ way. With that, the Athenas held on to win the final set 15-13. Some of the players, some of the late calls should have went in the Leopards’ favor. “The calls affected the outcome of the game,” Maynes said.